A commonly overlooked, reversible biomechanical vulnerability of the sacroiliac joints (SIJ) makes them subject to injury even through minor trauma. When the sacrum is loaded with the superincumbent weight, the pelvis is symmetrical and the line of gravity is posterior to the transverse acetabular axis, the pelvis has limited motion and the ligaments have a balanced tension. 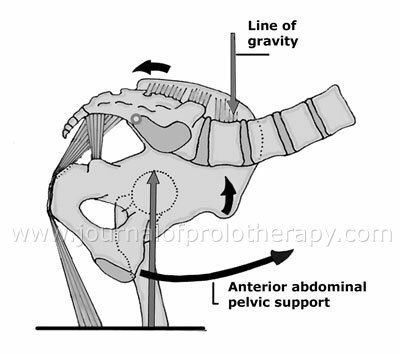 When the line of gravity moves anterior to the transverse acetabular axis in order to lift, bend or lower, or during pregnancy, the sacrotuberous ligament is loosened, the ligamentous balance is disrupted and can result in a dysfunction in anterior rotation of the innominates on the sacrum. The innominates will rotate cephalad and laterally on the sacrum and temporarily fixate. The resultant dysfunction will limit normal movement and function of the SIJ and can result in what appears to be a multifactorial etiology. Manual posterior rotation of the innominates on the sacrum to the balanced position will restore normal function and provide immediate relief of pain. Recurrence is controlled by simple specific corrective exercises. Instability can be corrected by proliferant injections to the long and short posterior sacroiliac ligaments and the pubic symphysis. This is probably the long sought mechanism of idiopathic low back pain syndrome. When it comes to idiopathic pain in the low back, we all see essentially the same thing. In 1982 White suggested “It may well be that idiopathic backache will be found to be caused by some condition that is a subtle variation from normal. Otherwise, we probably would have found the cause already. If back pain were caused by a highly unusual condition, then fewer people would suffer from this disorder.”1 It is the purpose of this paper to describe a commonly overlooked, reversible, biomechanical dysfunction of the sacroiliac joint as the mechanics of idiopathic low back pain syndrome and its appropriate management. When standing, the pelvis is symmetrical, the sacrum is loaded and ligamentous tension is in balance. No muscle power is necessary to maintain the position of posterior pelvic rotation. Other than some slight movement in the sacroiliac joint (SIJ) in flexion and extension, there is essentially no motion in the joint. The most critical support necessary to maintain the balanced sacro-innominate relationship when leaning forward is a strong voluntary contraction by the abdominal muscles. (See Figure 1.) 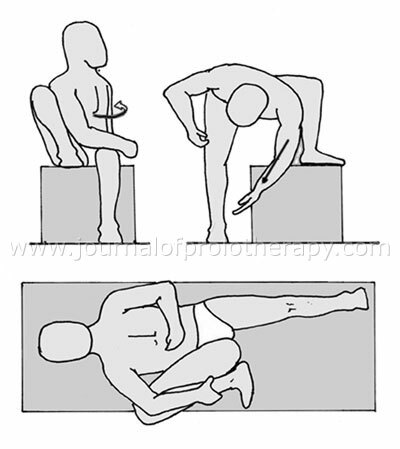 2, 3, 4 The SIJ is stable in posterior rotation, but vulnerable to injury with an anterior innominate rotation. Figure 1. Active abdominal support holds the pelvis in posterior rotation to maintain the ligaments in balance when leaning forward. If the balanced sacro-innominate relationship is not maintained, when leaning forward to lift, bend or lower, the line of gravity will shift anterior to the acetabula and will cause the innominates to rotate anteriorly on the sacrum on an acetabular axis. The pelvis will also rotate anteriorly with a protruding abdomen or with advanced pregnancy. Figure 2. 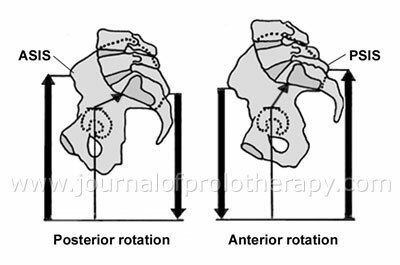 The dysfunction in anterior rotation alters tension in various ligaments. Ligamentous loosening: The dysfunction in anterior rotation will loosen the iliolumbar ligaments, destabilizing L4, 5-S1 increasing shear and torsion shear to the discs.8, 9 This is probably the most likely cause of disc disease. Anterior rotation will also loosen the sacrotuberous ligament, destabilizing sacral function and the pelvic diaphragm. The loose iliolumbar ligaments and increase in the lumbosacral angle are precursors of spondylolisthesis. 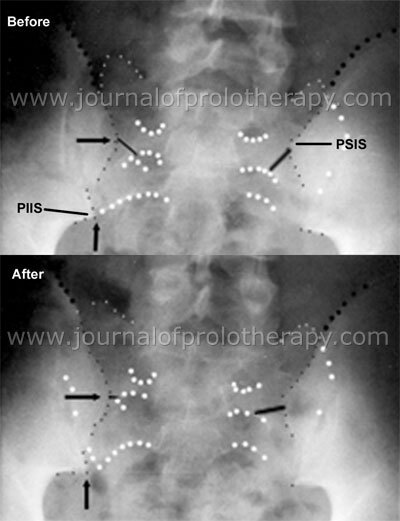 Primary Painful Points: A sudden release of the balanced position will result in a vertical shear of ilial S3 on the sacral S3 segment at the PIIS. This painful point is always present with SIJD, but it is commonly overlooked. The PIIS is immediately lateral, slightly distal and deep to the PSIS at the juncture between the ilial and the sacral origins of the piriformis and the gluteus maximus. This is the cause of piriformis syndrome. Simply by identifying this primary painful point at the PIIS the practitioner can make a positive diagnosis of dysfunction of the SIJ. Muscle Separation: The gluteus maximus, piriformis and the iliacus all have origins on the sacrum and the ilia. This vertical shear at the sacral axis stresses these dual origins and causes extra-articular painful points at the PIIS and distal to the PSIS. (See Figure 3.) As the sacral origin of the gluteus maximus stabilizes the sacrum when leaning forward, if the innominate bone rotates anteriorly on the sacrum, this muscle separation is enhanced. Figure 3. As the sacral origin of the gluteus maximus stabilizes the sacrum, the dysfunction in anterior rotation can cause the ilial origin to separate on a line to the greater trochanter. The sciatic nerve exits the pelvis just beneath the piriformis and not infrequently penetrates it. Pain and spasm in the piriformis can cause non-disc sciatica. I remember one 65 year-old woman who’s sacral origin of her gluteus maximus was so badly separated from the ilial origin it was palpable and rolled painfully under her ischial tuberosity when she sat. I could do nothing for her and I could not find any physician who believed that she had a dysfunction with her SIJ or a muscle separation. She eventually died without relief. A vertical shearing at the PSIS from the dysfunction on the conjoint origin of the gluteus maximus can cause pain into the trochanter, down the iliotibial band and into the lateral capsule of the knee. Changes in Leg Length: When the innominates rotate anteriorly they rotate over the acetabula causing the legs to appear longer than previously or, if just on one side, for the crest to be higher on that side and the pelvis asymmetrical. (See Figure 4.) An asymmetrical dysfunction will cause an asymmetrical pelvis with a long leg on one side. A bilateral symmetrical dysfunction will cause both legs to be longer than previously. A dysfunctional SIJ can cause asymmetrical development. An apparent long leg does not cause pelvic asymmetry. The pelvic asymmetry causes the long leg. The leg length will always shorten with correction and the pelvis will be symmetrical. Figure 4. Note the difference in height of both the ASIS and PSIS. Note that with anterior rotation the SIJ moves more above the acetabula causing an apparent long leg. Note also with anterior rotation that the lumbosacral angle is increased, as is shear to the disc. Some years ago I was doing scoliosis screening for the school system. I noticed a seven year-old boy with a lumbar curve who’s mother told me he was scheduled for surgery to be stabilized. He had no complaints of pain, but his pelvis was asymmetrical. I gently corrected an existing dysfunction of the SIJ. Immediately, his pelvis became symmetrical and the lumbar curve straightened. I showed his mother how to correct his pelvis. The problem resolved and the surgery was cancelled. Muscle and Nerve Stretch: Posteriorly as the innominates rotate up and over the acetabula the ischial tuberosity moves cephalad stretching the biceps femoris and the sciatic nerve. (See Figure 4.) This may cause a genu recurvatum or a non-disc sciatic or both. Anteriorly the ASIS move caudad stretching the nerve roots and the iliopsoas muscle. (See Figure 4. )3, 4 Clinical implications of spinal nerve root compression have been well documented10 and appear to point to disc degeneration as a causative factor. Dorsal root ganglia are more susceptible to stimulation than axons12; therefore, sensory changes may be more common than motor defects. Traction on nerve roots may produce a lancinating pain.13 Stretching the muscles is counter productive. Correct the SIJ and muscle tension normalizes. Figure 5. On a line from the umbilicus to the ASIS, Baer’s sacroiliac point is two inches from the umbilicus and McBurney’s appendicitis point is two inches from the ASIS. I recall a female patient with a four-year history of low back and abdominal pain. She had both ovaries removed without relief. She was referred to me and was free of both low back and abdominal pain immediately with correction of both of her SIJs. The loss of her ovaries was unnecessary and caused her no paucity of disrespect for her attending physician. Muscle Inhibition: Dorman found a positional inhibition of the gluteus medius when the innominate is held in anterior rotation.17 Dananberg found an inhibition of the peroneus longus with SIJD causing a functional hallux limitus.18 The hip flexors may suffer a positional inhibition when the pelvis is in anterior rotation. Dysfunctional loading: As the pelvis functions to decrease loading to the femoral head you can expect loading to be increased with dysfunction. This can cause microfractures in the subchondral bone and roughening of the joint surface with eventual arthritic changes. Dysfunctional loading can increase back pain and cause pain up and down the back and legs. 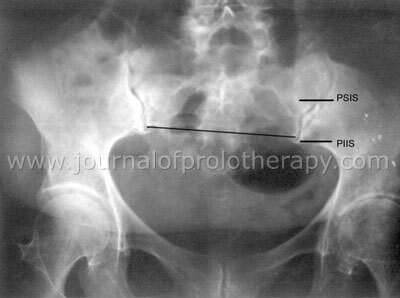 Limitation of normal pelvic movement with dysfunction can increase shear and cause instability at the pubic symphysis. When a patient with an arthritic hip has a replacement, in order for the leg length to be equal following surgery, any existing dysfunction should be corrected prior to surgery. Secondary Slippage: Although primary dysfunction is a cephalad and anterior rotation at S3 with S1 rotating caudad, a secondary slippage may occur at S1 and give the appearance of a posterior dysfunction or an upslip with a short leg on the more painful side. I cannot stress strongly enough that this secondary slippage is clinically insignificant. The dysfunction must be treated as a bilateral anterior rotation of the innominates anteriorly on the sacrum at S3. Correction is only with a manual movement in posterior rotation of the innominates on the sacrum. 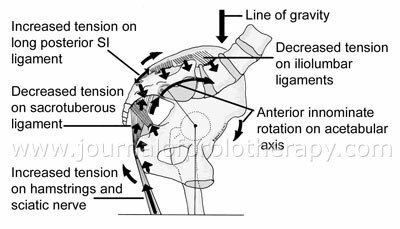 Correction and confirmation: I have found that SIJD is essentially always caused by an anterior rotation of the innominate bones cephalad and laterally on the sacrum with a pathological release of the balanced position. Simply identifying the associated painful points at the PIIS and PSIS can make a diagnosis. These points are extra-articular. An intra-articular injection into the intact capsule will become encapsulated and will reach those points only if there are tears in the capsule. Murakami, et al. compared periarticular and intraarticular injections for diagnosis of dysfunction of the sacroiliac joint.23 Using periarticular injections in 25 consecutive patients with SIJ pain they found that it was effective in all patients. In a comparable group, intraarticular injections were effective in 9 of 25 patients. An additional 16 patients who had no relief from the initial intraarticular injection were all relieved from a periarticular injection. Figure 6. The traction correction. First compare the length of the legs at the malleoli. Stand to one side and gently grasp one foot and ankle and lift the leg as high as comfortable without pain. Put traction on that leg in the long axis. Put that leg down and check the leg length again. You will probably find that leg to be shorter than it was previously. Do the same with the other leg. Continue doing this to each side, one side at a time, alternating legs each time, until the leg length no longer appears to change. Figure 7. The direct correction. With the patient supine, put one hand under the ischial tuberosity and the other on the posterior aspect of the iliac crest. Now pull up with the underneath hand and push down with the other in such a way as to move the posterior aspect of the innominate caudad and medially on the sacrum. Figure 8. An alternate direct correction. With the patient supine flex the hip and knee so as to bring the knee into the ipsilateral axilla. This can be done in any of several positions. Figure 9. Muscle energy corrections are a very powerful method of correction and can also be done in a variety of positions. The leg length will always appear to shorten with correction. With correction, the long leg will get shorter and the short leg will get shorter yet. The joint is very tight and acts similar to a stuck drawer and you must correct one side and then the other, 5-6 times on each side, alternating each time and checking the leg length at the malleoli, not until the legs are equal but until the leg length no longer appears to shorten. Once full correction is obtained the pelvis will be symmetrical, the legs will be of equal length and the patient will be essentially free of pain. Figure 10. Before and after x-rays demonstrating movement of the PSISs caudad and medially on the sacrum with correction. On the second day I have the patient demonstrate to me how they think I told them to do the corrections. I have found that patients can be quite inventive and may need to be re-instructed. There is no point in doing the corrections improperly. If the patient has no pain by the third day he is discharged to continue with his corrections as necessary. If the patient has chronic pain I do the same thing for the first three days. I also do some gentle contract/relax stretching as tolerated. If treatment is necessary after ten days I will put them in a lumbosacral support with instructions to put it on when lying supine on the support, doing corrections and then fastening the support. If the support is put on when the patient is erect and uncorrected, the support will only hold them in the uncorrected position. I like the lumbosacral support because of the accompanying instability at L4, 5-S1. Moderate instability responds to Prolotherapy to the long and short posterior sacroiliac ligaments and to the public symphysis if it is unstable. If you use a “shotgun” technique and Prolo all of the ligaments, the joint might tighten in the dysfunctional position, which can be extremely difficult to correct. Similarly, if you Prolo the iliolumbar ligaments before the sacroiliac joints are stable, you might not be able to correct the dysfunction. Prolotherapy may not be effective if the long posterior sacroiliac ligament has been avulsed from the PSIS, or if it is shredded or if it has undergone extreme viscoelastic failure. I have found that injections of Sarapin are excellent for the relief of trigger point pain along the iliac crests and around the trochanters. This is a non-steroidal, sterile aqueous solution of soluble salts of the volatile bases from Sarraceniaceae (pitcher plant). Severe joint instability may require surgical fixation, but the joint must be in a corrected position first. Also, if the joint is fixated you will negate its function as a force couple and loading forces will probably be increased to the femoral head. Forces that cause asymmetry will be blocked posteriorly and transmitted anteriorly to the public symphysis. An attempt to preserve function with a ligamentous repair might prove to be a better option. I will caution you against the traditional method of manipulation of a dysfunction of the sacroiliac joint whereby the patient is side-lying and the operator pulls back the shoulder and shoves forward and downward on the pelvis strong enough to cause cavitation in the joint. This movement can open the joint at which time the innominate bone may rebound giving you a correction, but there is an inherent danger in this. Consider, the iliolumbar ligaments are on slack and the lower lumbar discs are vulnerable. The long posterior ligament is on tension and vulnerable. Such manipulation can tear the annulus and extrude disc material as well as avulse or shred the long posterior SI ligament from its attachment to the PSIS causing a chronic instability. Prolotherapy will probably not help this and it may require a ligamentous repair. Case 1: I was called to radiology where I found a 68 year-old woman with acute pain in the low back and unable to lie flat for an x-ray. She was x-rayed in that position. The right leg appeared shorter, the pelvis was asymmetrical and the right SIJ was not congruent. (See Figures 11 & 12.) I then did a gentle correction of both SIJs. Immediately her pelvis became symmetrical, the leg length was equal bilaterally; she was free of pain and discharged. Figure 11. Before correction the patient could not fully lie down. Her pelvis was asymmetrical and the right leg was shorter than the left. Figure 12. After correction the pelvis was symmetrical; the legs were of equal length and the patient was without pain. Case 2: A 76 year-old woman with a chronic unstable SIJ for many years. Her husband was able to correct her with excellent relief, however relief was transient. I had advised Prolotherapy some years ago, but none was available in her state. She was finally treated when proliferant injections became available locally. At the first session she had injections of Sarapin to numerous trigger points along the crests and around both trochanters with excellent relief of pain. She had five sessions of Prolotherapy specifically to the long and short posterior sacroiliac ligament, about two to three weeks apart, before she was stable. She continued on her corrective exercise program until that time and now is essentially free of pain. Case 3: A 23 year-old female injured her low back when she slipped and fell hard on her buttocks while at work on January 23. She was referred for evaluation and treatment on January 24 and was in acute pain. She had no numbness or weakness in the legs and PSLR was negative bilaterally. Changes in apparent leg length demonstrated a bilateral anterior SIJD, worse on the right. Measurements of movement of the PSISs on the sacrum29 demonstrated a movement inferiorly and medially of 2.5 cm on the right and 1.6 cm on the left with correction. This was a substantial injury and probably involved some tearing of the anterior capsule of the SIJs. She was free of pain following correction, but had a chronic joint instability. She was instructed in a corrective exercise program. 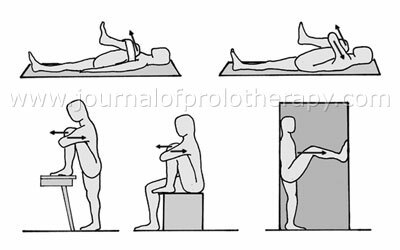 Mobilization of the SIJs to the balanced position always gave excellent relief of pain, but the relief lasted only a few days. A lumbosacral support helped some. The attending physician referred the patient to a neurologist with these findings in April, who also found involvement of the SIJs on a CAT scan. The neurologist referred the patient to an orthopedic surgeon specializing in sports medicine in May. He told her that she was too flexible to have a serious problem, that her problem was a lack of fitness, that she could become fit simply by riding an exercise bike, and discontinued further physical therapy. Case 4: A 49 year-old man strained his low back at work on February 3, while lifting a water cooler and was referred for evaluation and treatment on February 7. He stood and walked with his trunk laterally deviated to the right and complained of pain over the right SIJ. This pain was increased with leaning forward, sitting, and coughing or straining. There was no weakness or numbness in either leg. PSLR with the left leg increased pain in the right SIJ, which indicated a possible anterior rotation on the right. PSLR on the right increased the pain on the right side, which indicated a probable clinically insignificant slip at S1 on the right. There was no leg pain with PSLR. Observed changes in apparent leg length with correction demonstrated a bilateral anterior SIJD. The patient was free of pain following correction and instructed in a program of corrective exercises. He returned on February 8 and was markedly improved and doing his exercises properly. He did well until February 16, when he came in complaining of pain in the left SIJ. He had a high PSIS and a high iliac crest on the left when standing and an apparent long left leg when supine. Flexion of the left innominate on the sacrum equalized the leg length and the patient was again free of pain. Follow-up one month later found him to still be free of pain and continuing his exercises. I’m not sure if you are still checking these e-mails but I wanted to take a moment and write you on how your very simple sacroiliac movement has ended several years of chronic and severe lower back pain. I fell off a barstool about three years ago and ever since then have had severe pain in my right SI joint that sometimes would radiate down my leg. NSAIDs were the only way for me to get temporary relief. I did approximately 60 spinal decompression treatments because the MRI showed a disc bulge at L5/S1 (the bulge was on the left!). If anything the spinal decompression treatments made me more sore. To say I was desperate would be an understatement. I was under the assumption that my condition was caused by internal disc disease and that the pain was due to the release of chemicals into the surrounding tissue as the disc degenerated. As a chiropractor who also owns a multidisciplinary clinic I tried everything. Friday I was reviewing your website and tried the simple motion several times on each leg while lying on my bed. It seemed the pain decreased. I was sure this was only in my head. Being desperate I continued the exercises several times that day. Saturday I woke up, again with no pain. I put up all my Christmas lights climbing on a ladder all day long, stopping occasionally to do the movement. This is Monday still no pain. I am shocked and in disbelief! Immediately, today I began teaching your movement to all our patients and to all the doctors that work for me. Could it be that simple? I wonder how many people I have personally misdiagnosed with herniated/bulging discs that really had sacroiliac problems? Since your procedure is noninvasive and puts no torque on a lumbar disc I am implementing it as part of my general protocol for all our lumbar disc patients, as I see it there should be no contraindications in the patient doing this. Do you have any comments on correlation between the sacroiliac problem and lumbar disc disease? In the past I’ve done quite a bit of HVLA and honestly believe it can aggravate herniated disc… but your maneuver, I believe, is very safe. I’m not too sure about diagnosing the condition, but honestly what harm does it do to just get the patients doing the movement. Again thank you. I’m still in disbelief, but I’m very happy to be free of my chronic pain. My corrections are not spinal manipulations. There is no high or low speed thrust necessary or desirable. No jerking or popping is expected or sought. This is a precise skill and as with all skills, my method takes some time to learn and to perform. The skilled practitioner can have at least 85-90% of consecutive patients free of pain within about 10-15 minutes. I rediscovered this dysfunction in 1965. This is what I have found thus far. I am grateful to Dr. Hauser for this opportunity to present this research on the sacroiliac joint. I hope others will continue and improve on my biomechanics and my method. For more information and illustrations on the sacroiliac joint, it’s function, dysfunction and management. I invite you to visit www.thelowback.com. A CD with over 650 slides and 150 illustrations is also available. If you are interested in a workshop for your group or facility, please contact me. 1 White AA. Introduction. White AA, Gordon SL (eds): American Academy of Orthopaedic Surgeons Symposium on Idiopathic Low Back Pain. St. Louis, MO, CV Mosby Co. 1982, p 2. 2 DonTigny RL. Dysfunction of the sacroiliac joint and its treatment. Journal of Orthopedics and Sports Physical Therapy. 1979;1:23-35. 3 DonTigny RL. Pelvic Dynamics and the S3 Subluxation of the Sacroiliac Joint. CD-ROM, DonTigny, Havre, MT © registered 2001, continually revised to 2010. 4 DonTigny RL. Anterior dysfunction of the sacroiliac joint as a major factor in the etiology of idiopathic low back pain syndrome. Phys Ther. 1990;70:250-265. 5 Fortin JD. Sacroiliac joint injection and arthrography with imaging correlation. In Lennard TA (ed) Philadelphia. Reprinted in Vleeming A et al (eds) Fourth Interdisciplinary World Congress on Low Back Pain. San Diego, CA 9-11 November ECO Rotterdam, P 533-544, 1995. 6 Vleeming A, el al. The function of the long dorsal sacroiliac ligament: its implication for understanding low back pain. In Vleeming et al (eds) Second Interdisciplinary World Congress on Low back Pain. San Diego, CA, 9-11 November. ECO, Rotterdam, p 125-137, 1995. 7 DonTigny RL. A detailed and critical biomechanical analysis of the sacroiliac joints and relevant kinesiology: the implications for lumbopelvic function and dysfunction. In Vleeming A, Mooney V, Stoeckart R (eds): Movement, Stability & Lumbopelvic Pain: Integration of research and therapy. Churchill Livingstone (Elsevier). Edinburgh, 2007, pp 265-279. 8 DonTigny RL. Function of the lumbosacroiliac complex as a self-compensating force couple with a variable force-dependent transverse axis of rotation: A theoretical analysis. Journal of Manual and Manipulative Therapy. 1994;2:87-93. 9 Pool-Goudzwaard AL, et al. 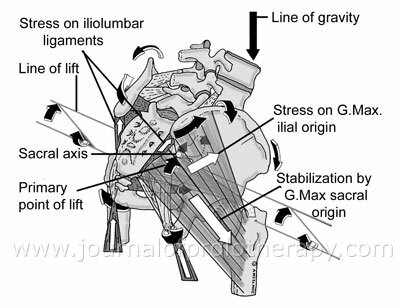 The iliolumbar ligament influence on the coupling of the sacroiliac joint and the L5-S1 segment. In Vleeming et al (eds) The Third Interdisciplinary World Congress on Low Back and Pelvic Pain. 19-21 November, Vienna, Austria p 313-315, 1998. 10 Bohannon RW, et al. Spinal nerve root compression-some clinical implications: A review of the literature. Phys Ther. 1987;67:376-382. 11 Sunderland S, et al. Stress-strain phenomena in human spinal nerve roots. Brain. 1971;94:120. 12 Bogduk N, et al. Clinical Anatomy of the Lumbar Spine. New York NY, Churchill Livingstone Inc. 1987, p134. 13 Smyth MJ, et al. Sciatica and the intervertebral disk: An experimental study. J Bone Joint Surg (Am). 1959;40:1401-1418. 14 Baer WS. Sacro-iliac strain. Bull. Johns Hopkins Hosp. 1917;28:159. 15 Mennell JB. The science and art of Joint manipulation: The spinal column. J & A Churchill Ltd, London, vol 2, P 90, 1952. 16 Norman GF. Sacroiliac disease and its relationship to lower abdominal pain. American Journal of Surgery. 1968;116:54-46. 17 Dorman TA, et al. 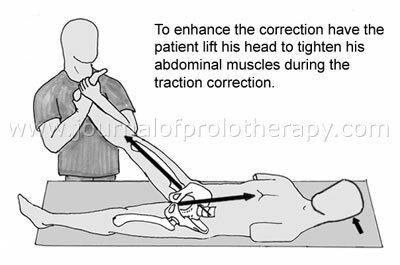 Muscles and pelvic clutch: hip adductor inhibition in anterior rotation of the ilium. Journal of Manual and Manipulative Therapy. 1995;3:85-90. 18 Dannanberg HJ. Lower back pain as a gait-related repetitive motion injury. In Vleeming A, Mooney V, Dorman T, Snijders C, Stoeckart R (eds): Movement, Stability & Low Back Pain: The Essential Role of the Pelvis. London, Churchill Livingstone, 1997 pp 253-267. 19 Fukushima M. Radiographic findings before and after manual therapy for acute neck pain. International Musculoskeletal Medicine. 2008;30(1):1-19. 20 White AA. Introduction. White AA, Gordon SL (eds): American Academy of Orthopaedic Surgeons Symposium on Idiopathic Low Back Pain. St. Louis, MO, CV Mosby Co. 1982, p 2. 21 Flynn T, et al. A clinical prediction rule for classifying patients with low back pain who demonstrate short-term improvement with spinal manipulation. Spine. 2002;27:2835-2843. 22 Fritz JM, et al. Subgrouping patients with low back pain: evolution of a classiﬁcation approach to physical therapy. JOSPT. 2007;37:290-302. 23 Murakami E, et al. Effect of periarticular and intraarticular lidocaine injections for sacroiliac joint pain: Prospective comparative study. J of Orthopaedic Science. 2007; May 12(3): 274-280. 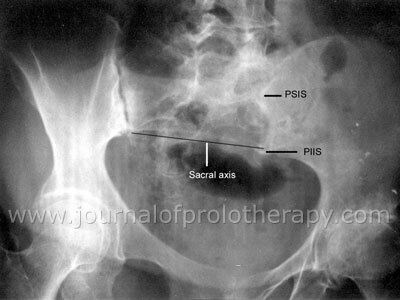 24 Yeoman W. The relation of arthritis of the sacroiliac joint to sciatica. Lancet. 1928;2:1119-1122. 25 Davis P, et al. Evidence for sacroiliac disease as a common cause of low backache in women. Lancet. 1978;2:496-497. 26 DonTigny RL. Evaluation, Manipulation and Management of anterior dysfunction of the Sacroiliac Joint. The D.O. 1973;14. 27Shaw JL. The role of the sacroiliac joint as a cause of low back pain and dysfunction. In Vleeming A et al (eds): The First Interdisciplinary World Congress on Low Back Pain and its Relation to the Sacroiliac Joint, San Diego, CA, 5-6 November, p67-80, 1992. 28 Borowsky CD, et al. Sources of sacroiliac region pain: Insights gained from a study comparing standard intra-articular injection with a technique combining intra- and peri-articular injection. Arch Phys Med. 2008;89:2048-2056. 29 DonTigny RL. Measuring PSIS movement. Clinical Management. 1990;10:43-44.
biomechanics, dysfunction, gait, low back pain, sacroiliac joint, Richard L. Dontigny, PT, Volume 3 : Issue 2 : May 2011, Wonder Why?